Biz4group serving the major verticals of IT industry offering solutions across the globe. With an overall industry wise experience of 15 years, the organization works with serious and like-minded partners around the globe to meet the business objectives. Based in Florida, USA, the company offers a wide array of services ranging across the web, mobile and enterprise niches. The Agile Development Process of the company has felt the relevant footprints in the market and thus serving prominently with disruptive technologies. The close-knit process framework over the technology sector offers resourceful IT development services to the clients as per their defined goals. The company foresees to be the most entrusted IT organization by deep collaboration with the partners. Honesty, integrity, empathic leadership, mutual respect serves to be the core values of the organization. As a top mobile app development company in Florida, the company offers cutting-edge app development services like Mobile App Development Services, Website Development, Software Development, IoT devices etc. to reach the niche market. 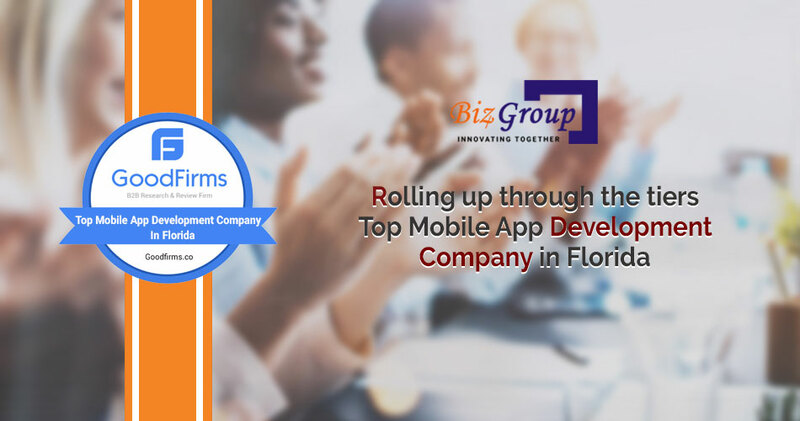 With the latest research evaluation by GoodFirms in Florida, it was known that Biz4group has been ranked among the Top Mobile App Developers in Florida and hasadvanced their rank from 10 to 3 for the same. The firm’s profile has been upgraded to Featured Listing as well as the logo has been included in the Featured Partners List of GoodFirms. GoodFirm is a great platform and has helped our organization to expand the business. This achievement has put a significant impact on our brand image and has multiplied our industry wise value and credibility, says Sanjeev. Not only this embedding GoodFirms badge on our homepage has made us a stand-alone player in Top Mobile App Development Company. GoodFirms has researched the top mobile app development companies in Florida and rated them according to the following 6 criterion – Reviews, Market Penetration, Cutting-edge technology, Creativity, Experience and Portfolio. Conclusively, Biz4Group has made to the top of the hill and is rated as the top mobile app development company in Florida.